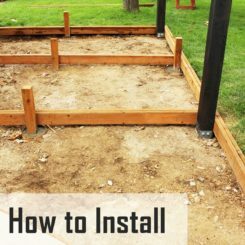 This is a tutorial that shows a step-by-step method for installing concrete deck footings, specifically for a low deck or wood patio. 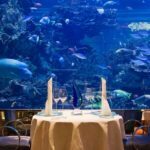 There are a variety of ways to do this, of course, but this is a very fast and relatively simple way that we’ve used for multiple projects with excellent results. 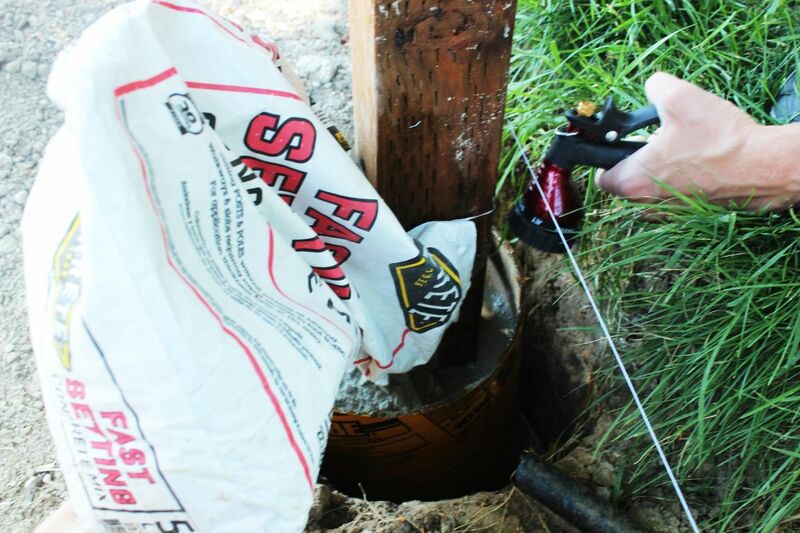 The key for successful footings is accurate measurement and alignment prior to post placement; after that, the rest of your deck’s building should go smoothly. 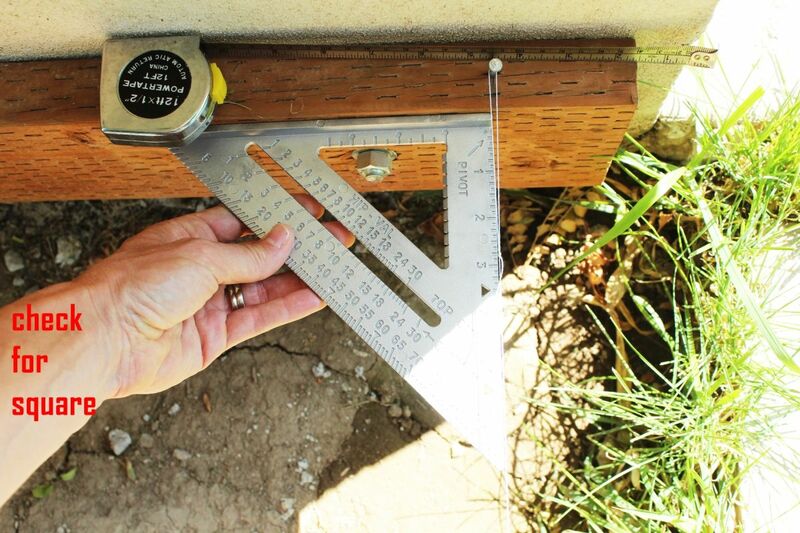 As with any building project, you’re going to want to measure your deck area and then determine where you want/need support. 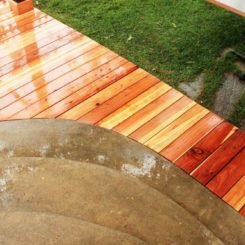 This deck’s dimensions are about 14’ x 25’ (with a portion of that cut out for concrete steps). Along the long side, five support posts will be used, spaced roughly every 7’. 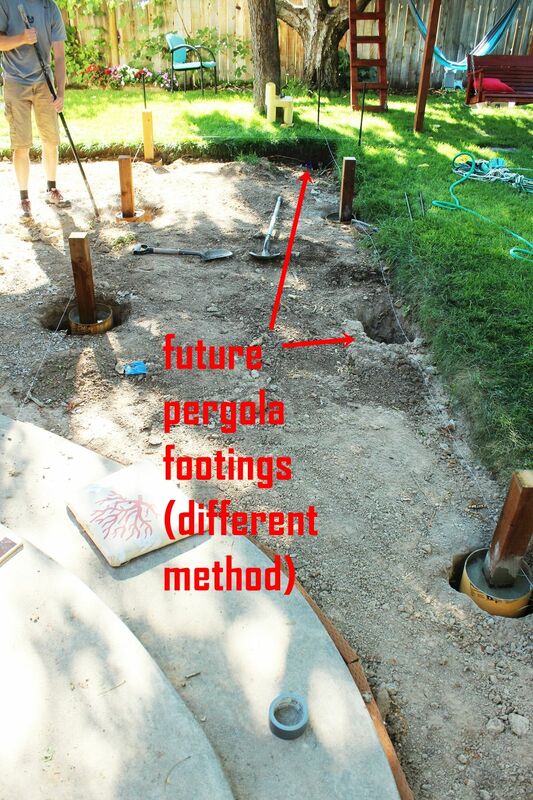 (Note: Because a pergola is being built above the deck, two of the support posts will be larger beams than these 4×4 posts; a tutorial on installing those posts will be separate.) 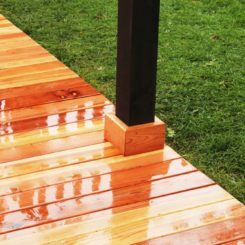 There is one middle support post along the shorter side, and then two posts placed in the center of the deck. 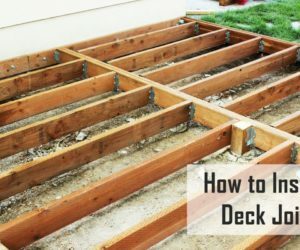 Dig holes to the depth that is required for support for your deck height. Because this will be a low deck, the holes dug are about 18”. 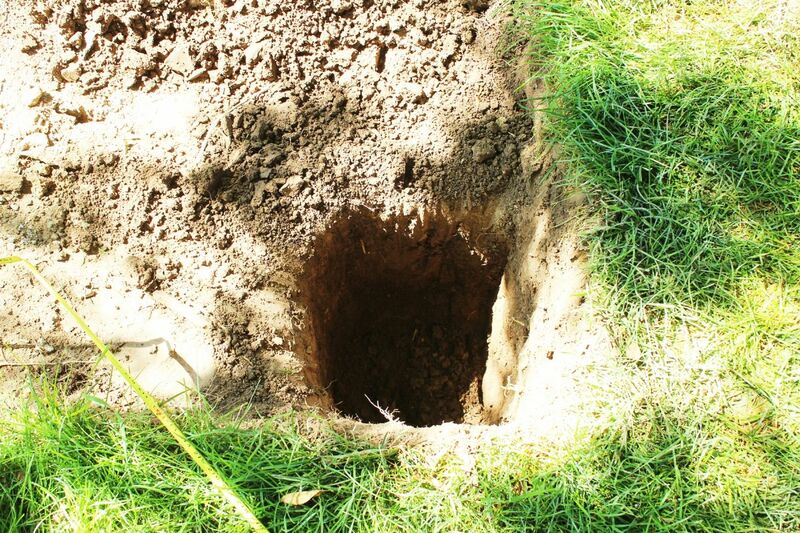 For a 4×4 post, a diameter of 12” is sufficient; try not to go much wider than this, as it just makes for extra digging work. 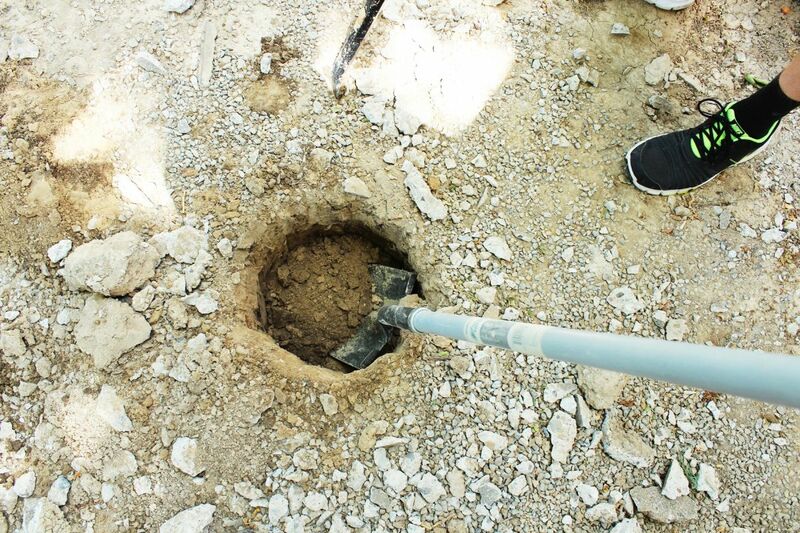 Tip: It’s helpful, depending on your soil type, to use a pry bar to loosen soil deeper than a shovel can. 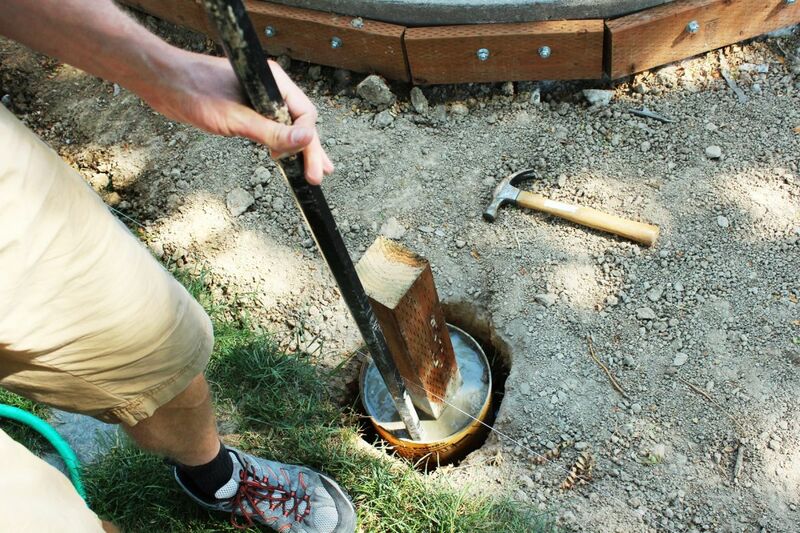 Alternate using the pry bar with scooping out the loosened dirt with a small shovel until you reach your desired depth for optimum deck support. 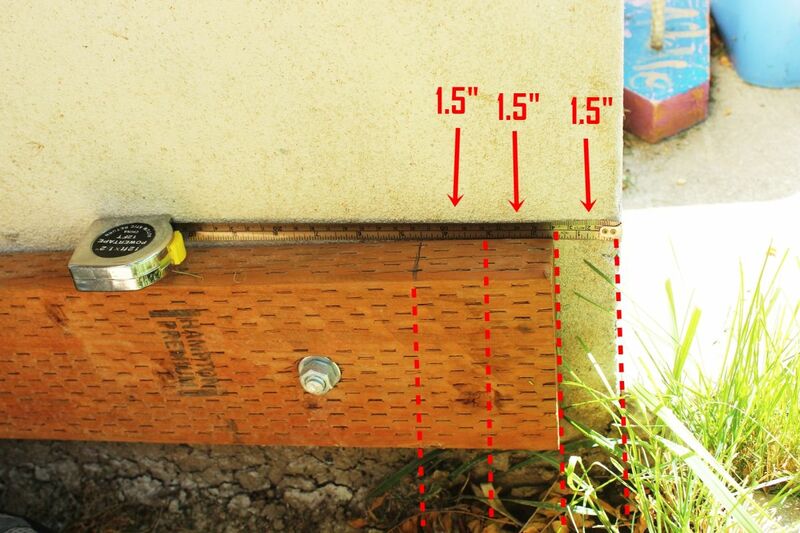 One of the best ways to determine a straight line in exterior building is via string. 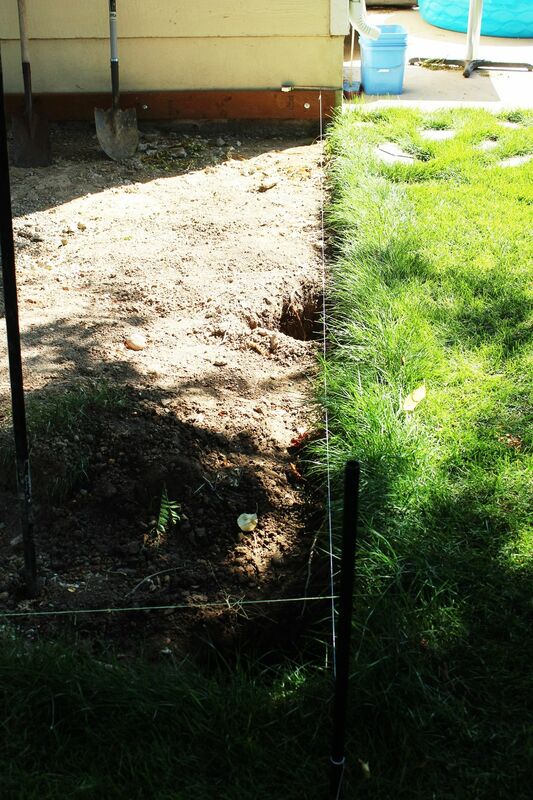 You’re going to want your post holes in a pretty precise line so the framing can be installed correctly and well. 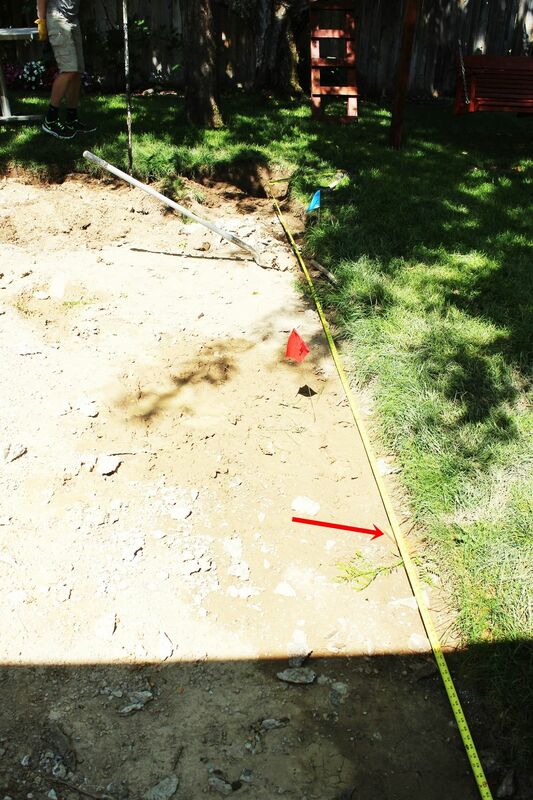 Measure two sides of where your string will run (e.g., in this instance, the center string is exactly 7’ from the foundation of the house; the outer string is 14’ out), then attach the string at those points. 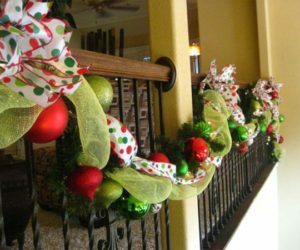 This will ensure a straight line; it’s a good way to mark level, too, if you add in a level check and adjustment to the stringing. 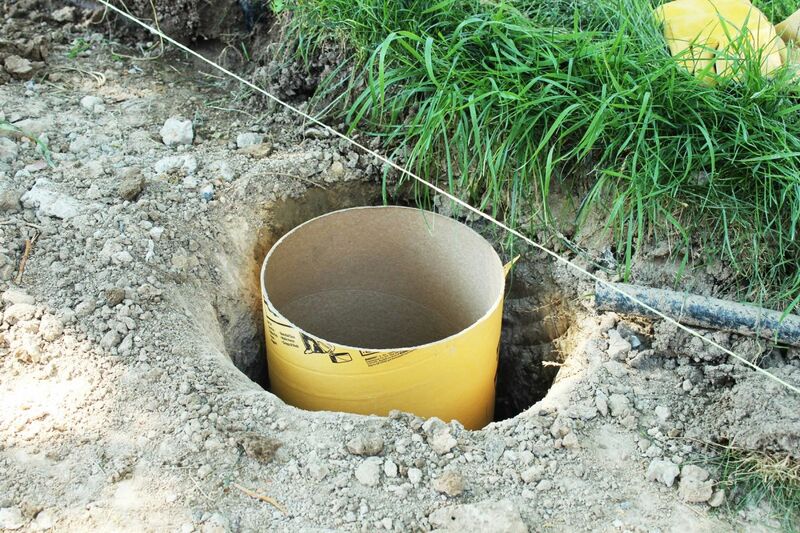 Once all your holes are dug, it’s time to fit them with concrete forms. 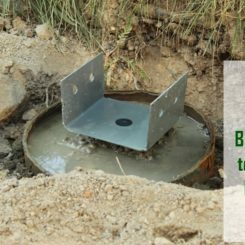 For installing 4×4 post footings, a 10” diameter concrete form works beautifully. 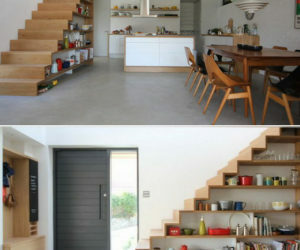 Measure, then cut the forms to hit at your desired height. 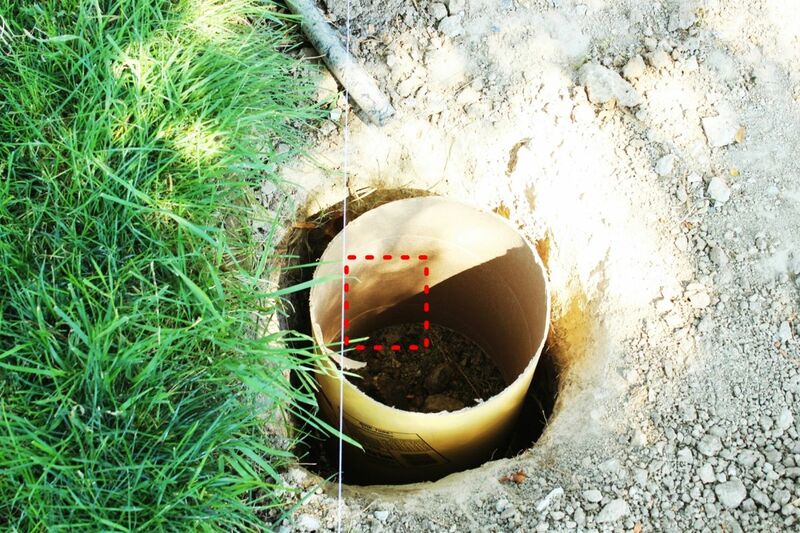 Note: Concrete forms are excellent for holding concrete in place for footings that need to extend above ground. 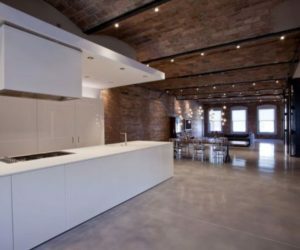 In this example, however, the concrete support needs to reach only to ground level, not above. 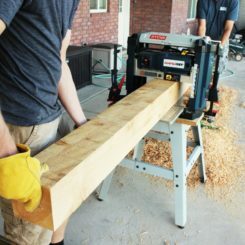 Use a hand saw to cut the concrete forms at your desired height. 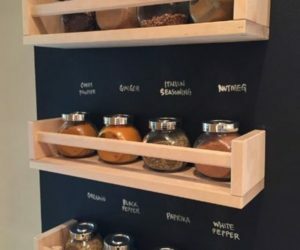 Cut your 4×4 posts to be a bit higher than what you’ll actually need. 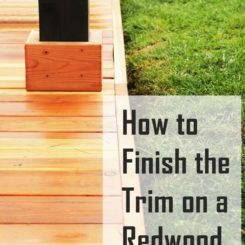 In this example, 8’ long 4×4 posts were cut precisely into thirds, because they need to extend only about 8” above ground, and we wanted to have a bit extra. You always want a few inches more than what you think you’ll need. 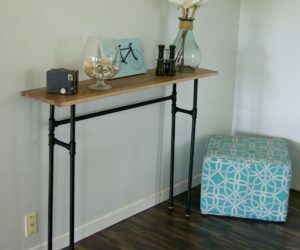 The extra post will be sawed off later at the precise height needed, so you don’t need to worry about making them exact at this point. Just make sure they’re long enough, and a few inches more than that. 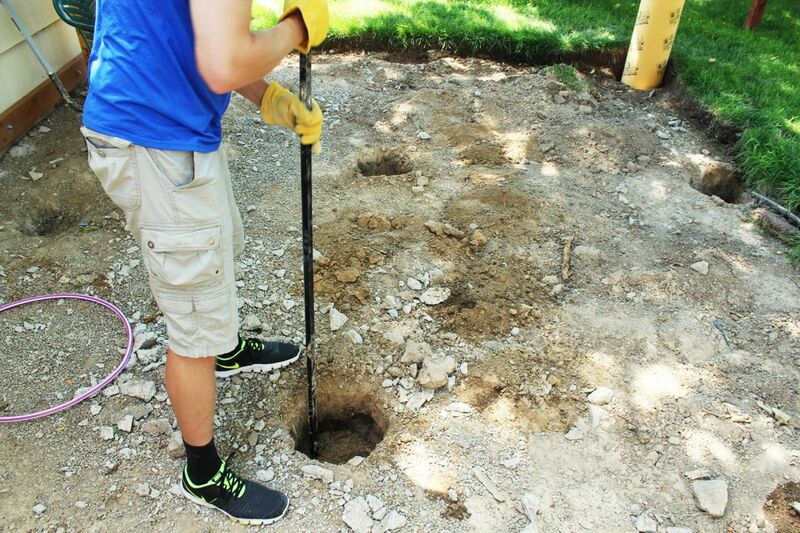 Before you actually set your posts into the concrete, you need to determine exactly where the post should hit. You used string to determine the position of your holes, but now you need to run string to determine the exact placement of your posts. Once they are set, there’s no changing them. 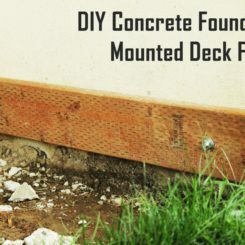 In this example, part of the deck frame is mounted to the foundation of the house, so measurements are made off of the end point of that frame. Two 2x6s will serve as the outer frame, and an additional 2×8 will be mounted on the outside of those boards for the finishing side piece. 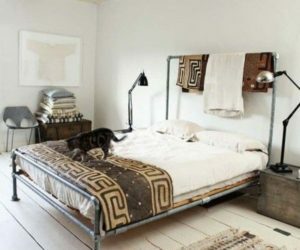 In total, 4-1/2” are required outside the 4×4 post to make the frame work. This is measured here. 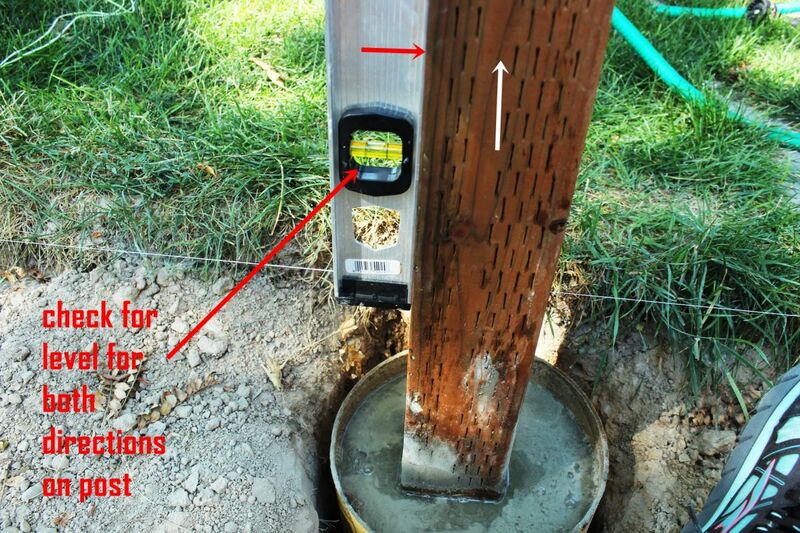 Pound a nail in at the point where your post must align, then run some string to the post install corner. 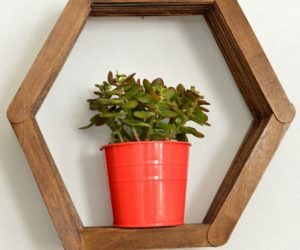 Use a square to determine 90 degrees. 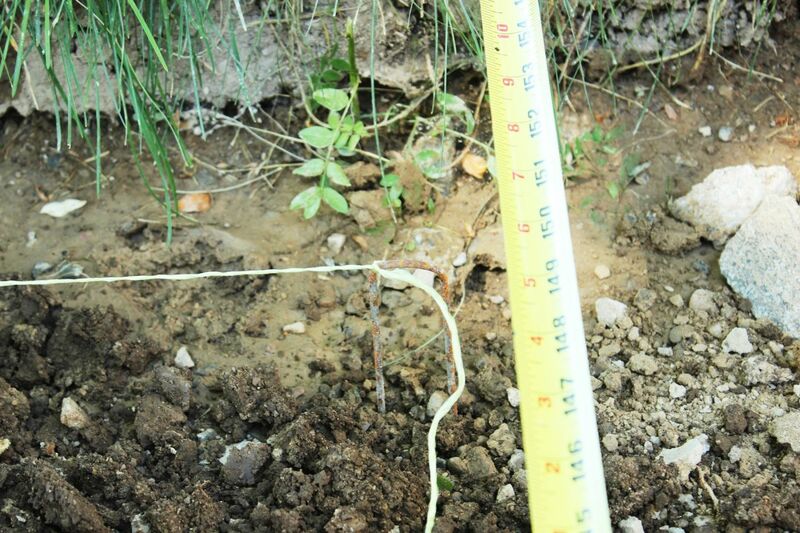 Pound in a stake that corresponds perfectly to your 90-degree string, and tie the string taut onto the stake. Viola! 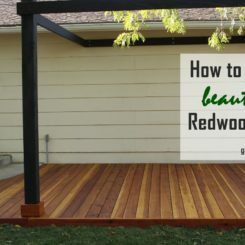 You have a straight, 90-degree line from one definite corner of your deck to the future position of a corner of your deck. Do the same thing with a string running perpendicular to create the full and precise corner position. Check for 90 degrees. 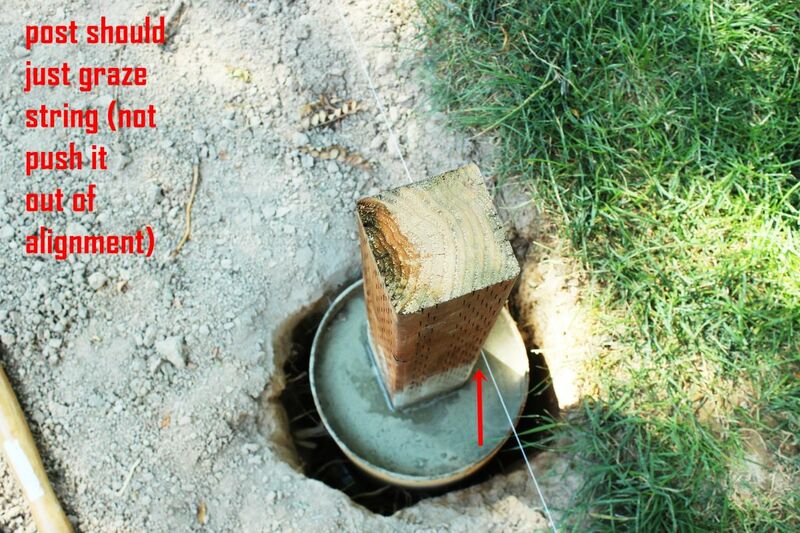 Place your concrete forms into all the holes along both strings. The string should run to the side of center above your form. 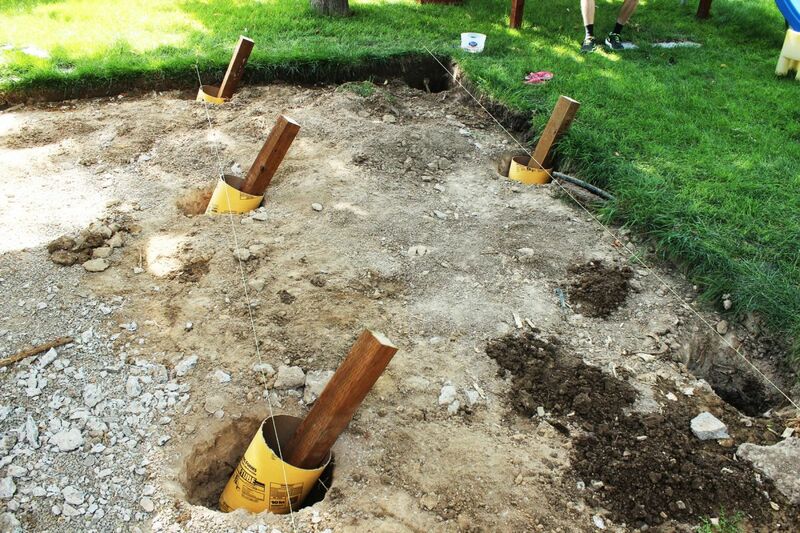 In fact, you should aim to have your post placement as close to the center of your concrete forms as possible; however, if they’re a little off-center, it’s okay as long as there’s enough room for the concrete to form all the way around the post. 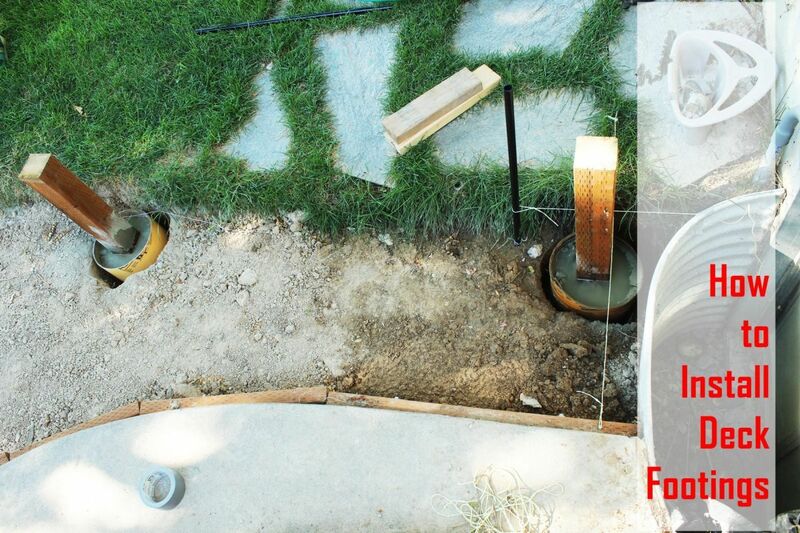 Once your concrete form is positioned and ready, use a hose to run about 2” of water into the bottom of it. 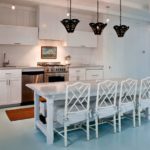 You’ll want to make sure you have fast-setting concrete that specifically states it doesn’t need to be pre-mixed. 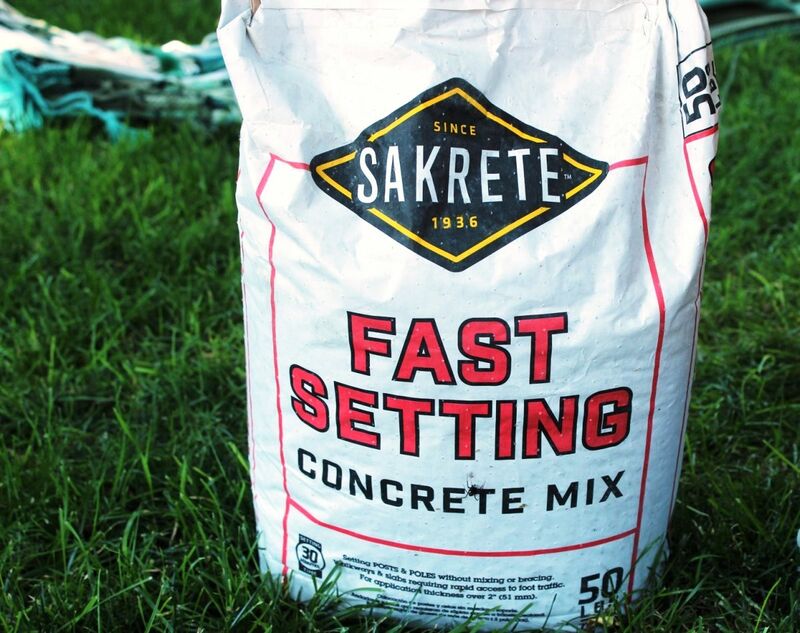 This is so quick and easy, if you get the right concrete mix. 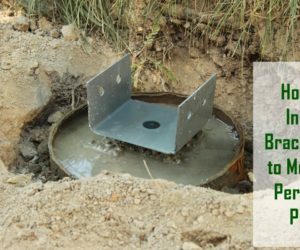 Pour about 1/5 or 1/4 of a 50# bag of concrete mix into the water at the bottom of your concrete form. 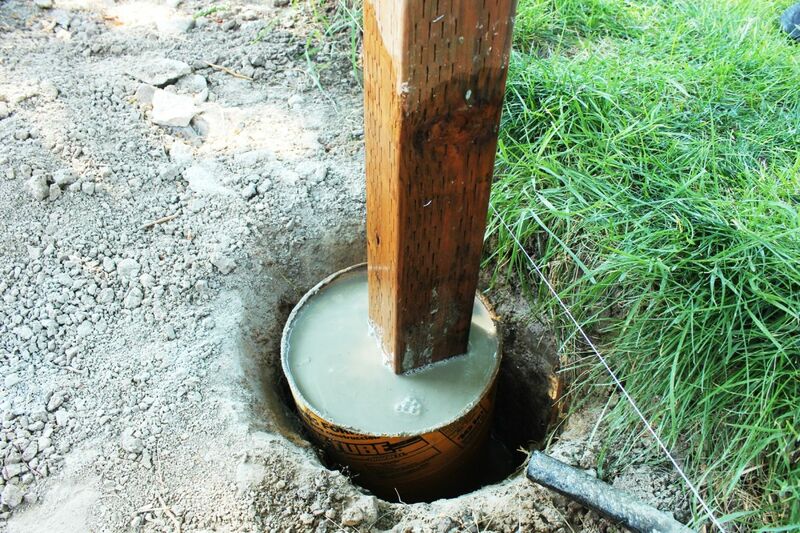 Place the post down into the concrete, and immediately check for level against the string. 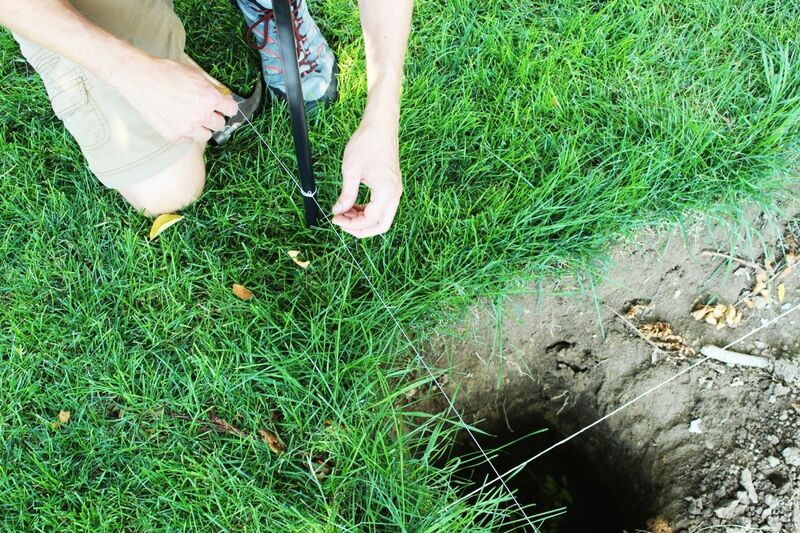 Be sure the side of the post next to the string only grazes it and doesn’t push it out of place in order to touch. If it’s not quite right, pull the post out and wiggle it down into the concrete again or slide it until you’re exactly level, barely touching the string. 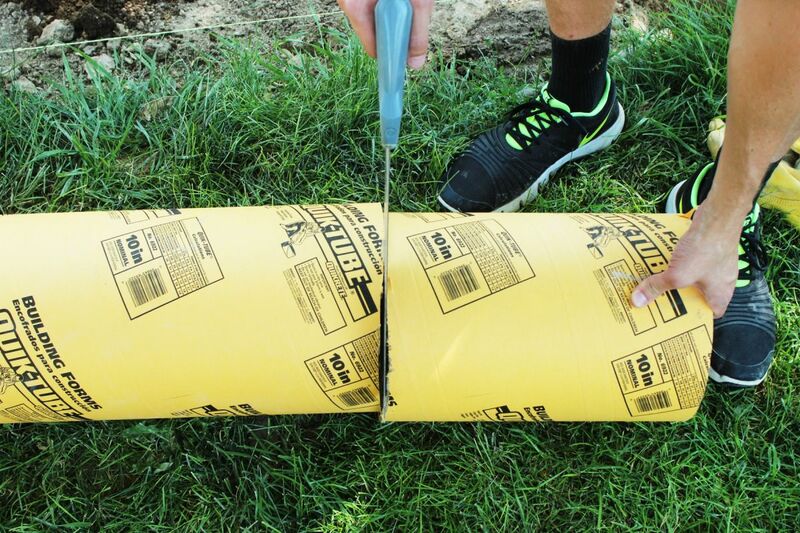 Once you’re exactly level (remember, this might take a minute or two to get right, but be sure you get it right), pour about half the bag of concrete into the hole while someone holds the post firmly. 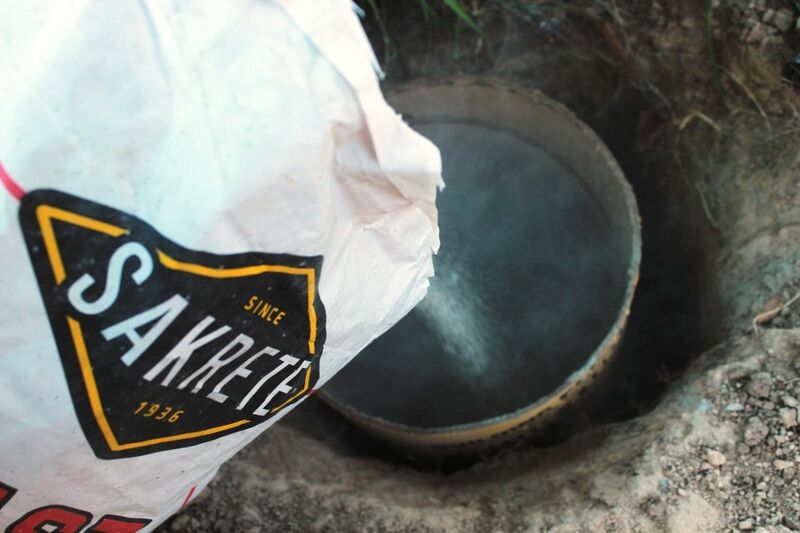 Add a little water, then pour the remainder of your concrete mix in. 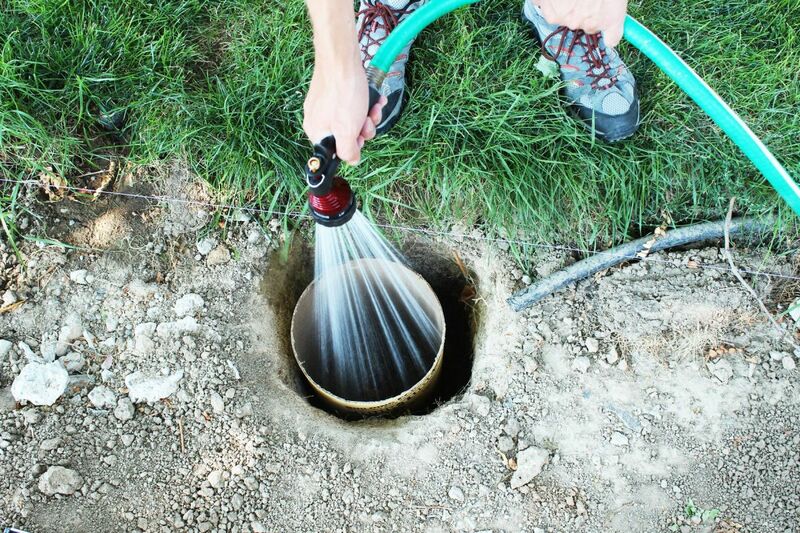 Add more water until it’s a couple of inches above your concrete mix. 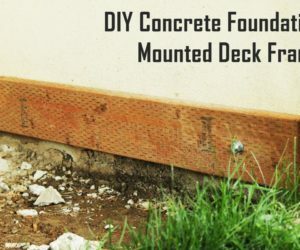 Use the pointy end of your pry bar to make holes in your concrete. These won’t actually be holes, of course. 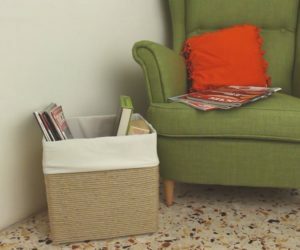 What you’re doing with this up-and-down pry bar poking is “mixing” the concrete, finding pockets of air, and giving them a place to escape before the concrete sets. 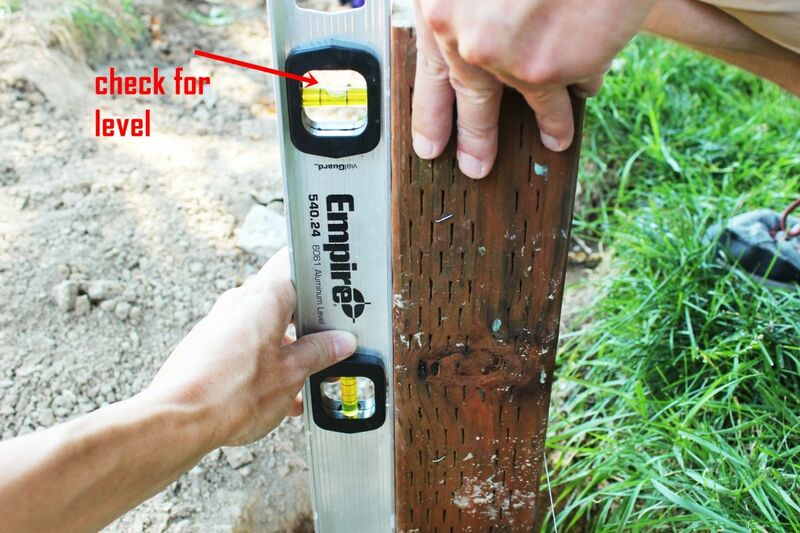 Immediately check for level, on perpendicular sides of your post. 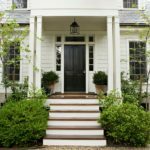 Likely, your post has moved slightly, so make any adjustments necessary right now before the concrete starts to really set. 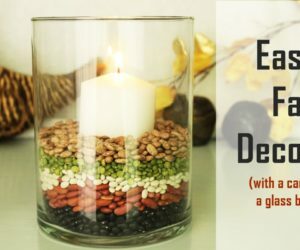 Remember, it’s fast-setting, so you have some minutes but not a ton of time. 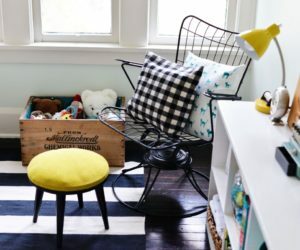 At the end of the day, the side of your post should just graze the placement string, without bending it or pushing it out of the way. 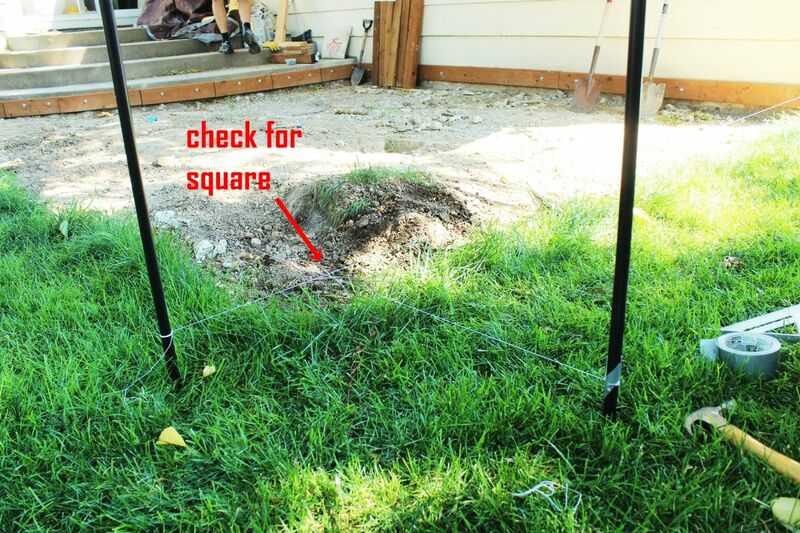 Repeat this process for all of your footings holes, being sure to check for level in multiple directions, multiple times on each post while the concrete is fresh. Allow to fully dry and cure, according to weather and package instructions. 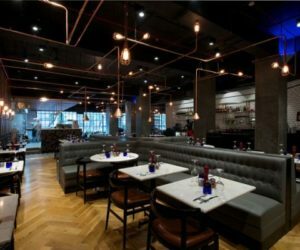 It’s looking great! 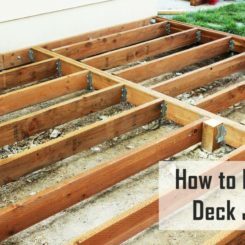 You’re well on your way to completing your deck frame. 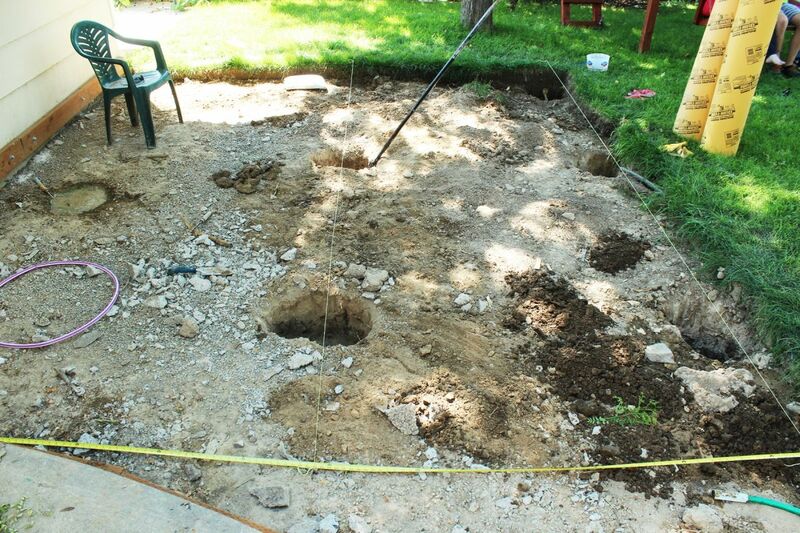 Note that two of the holes here are for pergola posts, which will be installed using brackets in the concrete. That will be another tutorial for another day. Happy deck building!